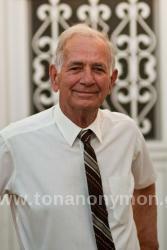 Christos Antonopoulos was born in Athens in 1935 and he was the youngest of eight siblings. He emigrated at the age of 22 to Hamburg, Germany, where he worked for three years as a mechanic in the shipyards. In 1959 he moved to Rotterdam where he worked as a mechanic in the repair section of the “VNS” shipyard until 1966. In 1964 he met for the first time his elder brother Argyris Antonopoulos, who asked him to follow him in the U.S. Two years later he moved to California. There he initially worked at his brother’s restaurant, until he got his permit to work as a mechanic. In 1968 he got married to Paraskevi Diploudi and in 1970 their son Nikos was born. He bought his first camera, an 8mm Bell&Howell, as well as a Bell&Howell projection machine. As the films piled he realised the need for montage so he bought an 8mm editing table with the necessary equipment and he spent a lot of time making projections and stitchings? with the splitter. Three years later his daughter Aggeliki was born, and at the same time the new format Super 8 appeared in the market which had built-in sound band? for synchronised reproduction of picture and sound. Then he bought the camera GAF SUPER 8 and the respective projector. A bit later he purchased the respective editing table. In 1973 he started working in the Berk Industry factory in San Jose, California, as a mechanic in the section of aerospace applications. Soon he was promoted as a foreman in the section of mechanical production and in 1975 he received a honour distinction from his company for a patent for the benefit of the company. From then until 1979 that he returned to Greece he received many distinctions in the area of applied patents, while in 1979 he was invited by San Jose University to teach applied mechanics. He accepted the invitation but only for a few lectures as he had already begun the preparation for his return to Greece with his family. In Athens he first worked in the hotel Grande Bretagne for a few months until he found work in his sector. In 1980 he started working as a foreman in the BIEN factory where he remained for 15 years, until he retired. Today he lives in the island of Chios with his wife and he is a dedicated mastic producer. Both of his children studied film direction in the university of California (UCLA).